We’re located in the village of Churchdown, not far from J11 (if travelling South) or J11A (if travelling North) of the M5. 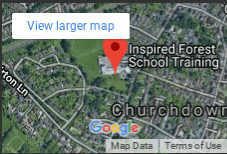 The Forest School training centre is based in the grounds of Churchdown Village Junior School, Gloucestershire. Our car park is full, but there is ample free parking located off Church Road (POINT A), clearly signposted alongside Churchdown Social Club (behind the Bowling Club on the map). The school is a two-minute walk from the carpark: simply cut through the park, turn right and the school is 200m on the left hand side (POINT B). Any questions then please give us a call.